The FacePRO™ Facial Recognition Solution automatically matches a person’s face using live or recorded video from Panasonic i-PRO cameras to a database of enrolled faces and performs notification and alerting of face matches. It provides a real-time processing capacity of up to 20 cameras per server and can execute high-speed searches of up to 30,000 registered reference faces. The deep learning technology used in the new software was jointly developed with the National University of Singapore and improves facial recognition performance by up to 500%*3 compared to conventional systems. 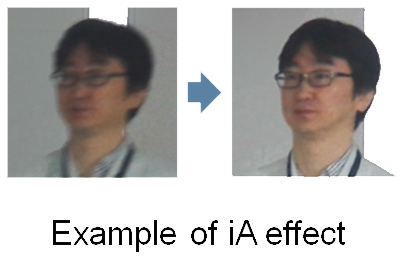 *3 Rejection rate reduced to 20% when the wrong person acceptance rate is set to 0.01 with the IJB-A face image dataset. A unique algorithm that combines deep learning, a machine learning method, with a similarity calculation method that suppresses errors, enables recognition in situations that were difficult with conventional facial recognition technology, such as when the face is angled (up to 45 degrees to the left or right or 30 degrees up or down), partially hidden with sunglasses, or changed by aging. The iA function enables cameras to automatically detect the scene and automatically optimize the settings accordingly to improve the detectability of the video images. The camera automatically detects the moving objects, movement speed, faces, and light intensity (day/night/headlights) found in video that are usually hard to see due to subject movement and backlight, and optimizes the settings in real-time and capture more optimal video of the subject. The Best Shot License Key included with this software can be installed on Panasonic i-PRO EXTREME series network cameras (sold separately) to automatically select the images suitable for facial recognition from the multiple face images captured when a person passes in front of the camera, and send only those selected images to the server. This enables high-quality images suitable for facial recognition to be sent without putting a load on the server. Since October 18, 2017, three units of Panasonic's facial recognition gate have been put into operation at Tokyo International Airport's immigration control. Without the need for prior registration of biometric data, the system compares photographic data of the traveler's face in the IC chip embedded in the person's passport with a photo taken at the facial recognition gate to verify the identity.